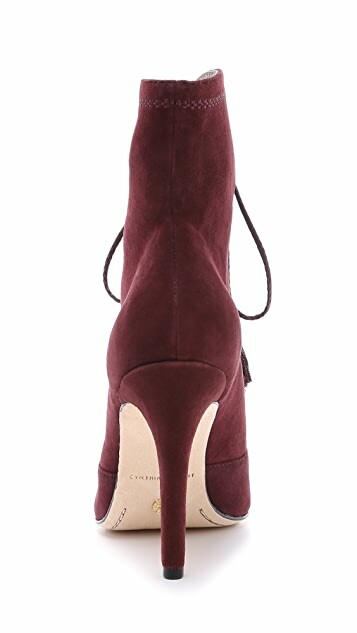 Pointed-toe Cynthia Vincent booties in rich suede. Tonal embroidery outlines the scalloped cutouts, and tasseled ties cinch the top. 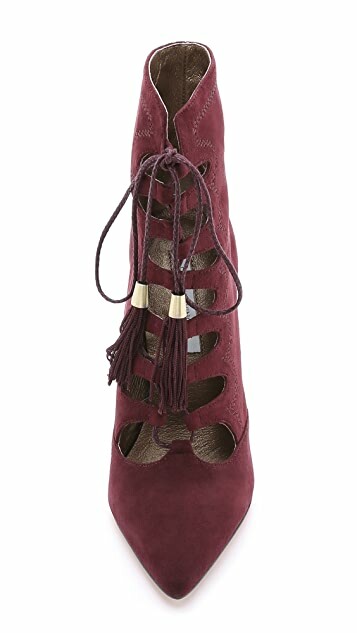 Covered stiletto heel. Leather sole. Following the great success of her ready-to-wear label Twelfth St. by Cynthia Vincent, the eponymous designer has branched into footwear, lending her signature eclectic hand to a range of unique, yet timeless shoes. By blending feminine elements with rich textures and quality materials, the Cynthia Vincent footwear collection will make a chic, classic addition to the modern woman’s wardrobe.